At Gites Corsica, we want you to enjoy a relaxing Corsica holiday, with no unwelcome surprises. That’s why we’ve put together this useful information about our Corsica rentals . Please take a moment to read through it, and if you’ve any further questions about your Corsica holiday , don’t hesitate to get in touch. A number of our Corsica holiday rentals welcome pets. The accommodation owner’s agreement is, however, essential. In addition, the pets and any other animals accompanying guests must be declared when contact is first made, and their presence in the accommodation must be recorded on contract signature. An additional charge may be made (specified in the property description) for pets and other animals. Each Corsica rentals contract is drawn up for a specified number of guests. If this number is exceeded, either on arrival or during the stay, the owner is entitled to refuse to take the additional persons, terminate the rental contract, or charge a higher rate. Heating is rarely included in the rental price: please check your Corsica rentals contract and/or information sheet for specific information. We advise you to ask the owner to provide an estimate of the daily cost of heating, as it is payable by renters separately. On your arrival at your Corsica holiday rentals property, and after an accurate inventory has been drawn up, a deposit will be requested. This will be refunded on departure, with deductions to cover the cost of any repairs, breakages or damage being made if necessary. Please note that refunding your deposit may take up to a week, depending on the time of your departure. Any dispute or complaint should be made to the Relais Régional of Gîtes Corsica (77 cours Napoléon, BP 10, 20181 AJACCIO, +33 4 95 10 54 30, info@gites-corsica.com) within three days of your arrival in the gite. Please note that the Relais organization will only take up the matter if the Corsica rentals contract has been made with a Gîtes Corsica member. The list of current members is provided to renters subject to the proviso that member names, correct as listed on the date of publication, may have changed subsequently. On request, Gîtes Corsica can draft a certificate of accommodation, providing evidence of your stay in Corsica holiday rentals accommodation covered by the Gîtes Corsica label. Any such request must be made in writing and accompanied by a copy of the Gîtes Corsica rentals contract. Provision of an outgoing telephone call facility at the gite is shown by a pictogram in the accommodation description. If you have a France Telecom card, please take it with you so that your phone calls can be charged directly to your France Telecom bill. There is no additional charge for cold water, cooking gas or electricity up to 8Kw/h per day. Above these limits, additional charges are due depending on metered consumption. The Reservation department and many owners accept holiday vouchers (French Chèques Vacances). Our Corsica holiday rentals that do so are identified by a pictogram. In France, the Caisses d’Allocations Familiales (Family Allowance System) can subsidise holiday expenses for children – please check eligibility with the relevant organization. Those renting a gite are responsible for its cleaning throughout their stay and prior to departure. The gite must be left in perfect condition. At some of our Corsica holiday rentals a cleaning service is available at an extra charge. 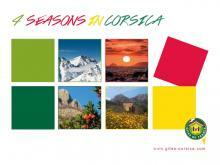 The Corsica rentals prices are shown in each description and cover the overall cost of gite rental. Prices are payable by the week (from 16.00hrs Saturday to 10.00hrs Sunday morning) or per weekend. Depending on gîte classification, supply of bed and household linen and cleaning services may also be available. Some Corsica holiday rentals are subject to local accommodation tax, so please check when you reserve. Accommodation tax should be paid at the end of your stay directly to the owner, at the exact amount levied by the local administration, unless accommodation tax is already included in the overall price agreed.